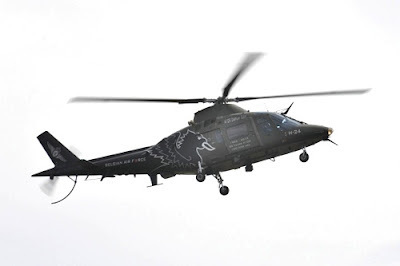 The new Agusta A109BA Hirundo Demo aircraft for the 2012 Airshow season had been officially rolled out at Beauvechain airbase on April 26th, 2012. At the same occasion two Benin Air Force pilots have completed their type conversion at the base. A photo report by Jef Pets. Yesterday, the 28th of April 2012, was inaugurated the monument in memory of the B-24 42-95220 crashed on Christmas Day 1944 at Rettigny (Gouvy). From the crew only 3 survived. Among them the pilot 1Lt. William W. Truxes, deceased the 1st April 2007. 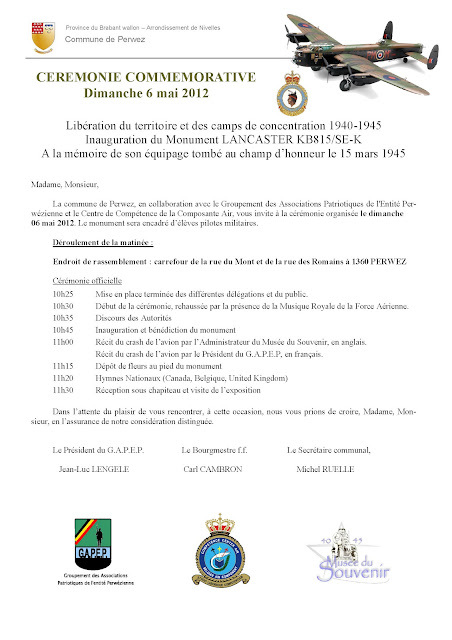 His son-in-law and his grand-daughter were present this Saturday at Rettigny for the inauguration which took place in the presence of a large audience. Video LiveLeak.com - Focke-Wulf Fw 190 First Flight. LiveLeak.com - Focke-Wulf Fw 190 First Flight. yduwelz sent this using ShareThis. 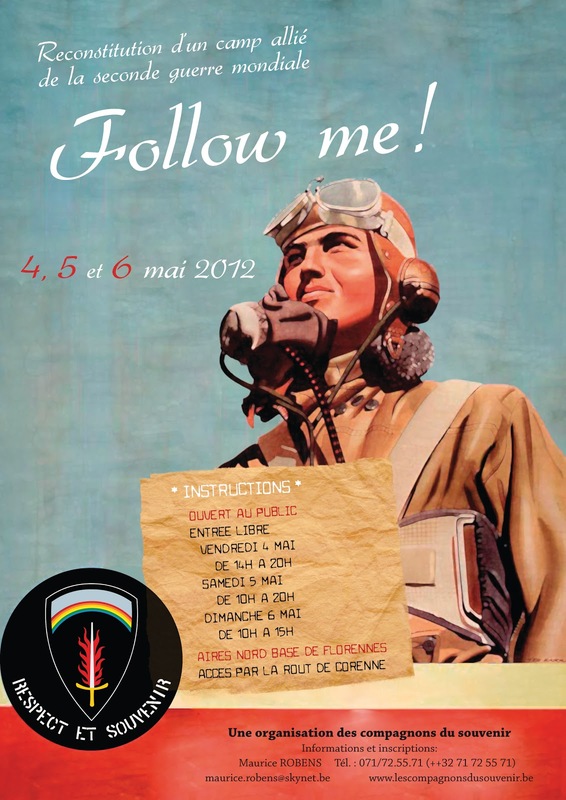 Ailes Militaires Belges : Vinyle Follow Me ! Coincé entre Sweet Little Sixteen et Retiens la Nuit j'ai découvert un 45 tours au titre évocateur : Follow Me!. Here's a preview of the Air Show to be held at the Canadian Warplane Heritage Museum this June. There are now 50 days until the 2012 Hamilton Airshow!! We have revamped our ticketing system so you can buy online, print at home or have it scanned from your smartphone. To ensure smooth traffic flow, we have also hired a professional parking specialist who is very experienced in moving large volumes of people to and from the offsite parking. The RCAF Snowbirds and CF-18 demo highlight the flying show plus the large line up of vintage aircraft featuring the only Canadian appearance of the B-29 Superfortress 'FIFI'. On April 17, 2012, at approximately 12 noon during the initial flight of the Lancaster for the season, while conducting recurrent crew training with the Lancaster Chief Pilot Don Schofield and Museum Chief Pilot Leon Evans, had the outer portion of the right wing tip compromised during the flight. The crew declared an emergency and immediately returned to Hamilton Airport for an uneventful landing with no further damage to the aircraft and no injuries to the crew. In discussions with the Transportation Safety Board, we have proceeded with our internal investigation of the occurrence. The preliminary examination indicates the outer right wing tip lower attachment bracket failed which allowed the outer wing tip to move in flight. At the present time, further examination to determine mode of failure of this bracket, the proper repair scheme and new inspection criteria for both outer wing tip attachments is ongoing. We have already shared all our findings with the Battl e of Britain Memorial Flight. 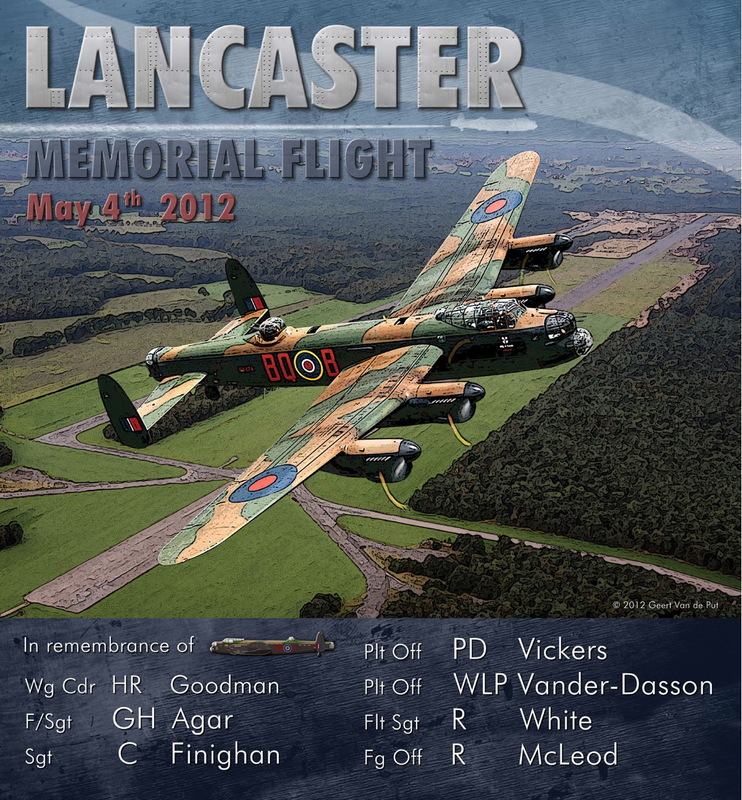 Our target date for returning our Lancaster to the skies is for the Hamilton Airshow on June 16th & 17th. Purchase your Hamilton Airshow tickets online and save on the admission price plus get through the gates faster. Regular admission tickets are valid for either day - print your tickets at home or save on your smartphone. Also available online are Ramp Pass, Photo Pass and Flightline Club. The flying show begins at approximately 12 noon and lasts to approximately 4:30 pm. Featured acts include the RCAF Snowbirds, Great War Flying Museum World War I aircraft, Vintage Wings Golden Hawk Sabre, Matt Younkin's Beech 18 (probably the most unusual act at our show), RCAF CF-18 demo and Red Bull racer Pete McLeod. However, the real stars of the show will be the 40 World War II vintage aircraft including the B-29 Supertress, B-24 Liberator, Helldiver, Lancaster, Corsair, Lysander, Spitfire, P-40, B-17 Flying Fortress and many more. Did you know it takes about 500 volunteers to make the Hamilton Airshow run? Everything from hospitality, security, admission, set-up, etc. requires volunteers. Volunteers receive free admission, t-shirt, breakfast and lunch and NO, you do not need to be a member of the Museum to help. Joel Ippolito (left) and his brother David (right) donated money for the flying restoration of the Grumman Tracker because they say the museum embodies their own passions: airplanes, history education. Work is expected to take up to 2 years to complete, at which time, David Ippolito, one of the company's directors and a licensed pilot, will have the opportunity to experience first-hand the excitement of flying the Tracker. As a local company we recognize the importance of preserving Canada's history for the next generation, says Ippolito And, as an aviation enthusiast, it felt like a really good fit to help the Canadian Warplane Heritage Museum, which hosts over 100,000 students and general visitors a year, to expand their flying collection. They were first purchased by the Canadian Forces in 1970 to replace the capable but increasingly difficult to maintain Chipmunk ab-initio trainers. CWH's Musketeer (CAF #134222) has been in storage dismantled in Merrickville, Ontario for several years and was discovered through an ad in Kijiji. The Musketeer arrived at CWH on Saturday April 7th and was quickly assembled. Temporarily, it will be left on display in its unrestored condition. From the Gift Shop...our new 2012 EXCLUSIVE Lancaster T-Shirt design has just arrived in stock. It looks a bit dark in the image but definitely looks much better in person. For our 40th Anniversary this year, we will be hosting four Fly-In Days at Canadian Warplane Heritage Museum. For aircraft participating, landing fees will be waived at John C. Munro Hamilton International Airport. 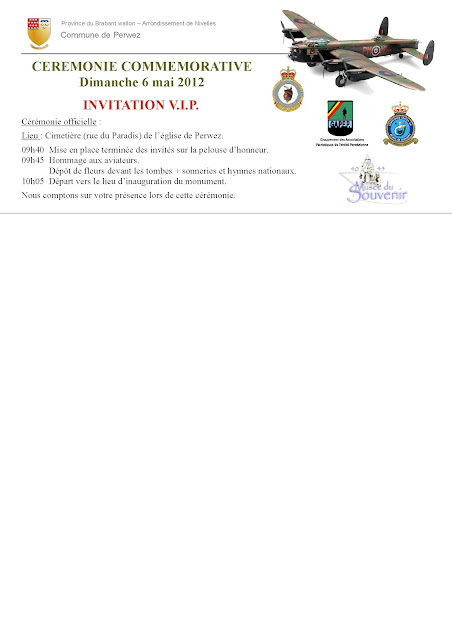 Additionally, all occupants in visiting aircraft receive free admission to the museum that day. The 2012 dates are all on Sundays from 9 am to 5 pm: May 27, July 8, August 19 and September 23. Regular admission rates apply to drive in visitors. Beauvechain. Le lieutenant avi Rutger Andries, pilote de l'A109 Display Team avec le lieutenant avi Igor Craeghs en 2010 et 2011, a officiellement passé le relais au lieutenant avi Filip Peremans. 1000 km Goal from the Dutch-Belgium Border to the French-Spanish Border! By Ritz—”Completing this flight is not only about flying the task. It is like a chain with many links. One missing,and it all falls apart.”—Tijl after his 1000 km goal/free-distance flight. Words from young Belgium pilot Tijl Schmelzer, who managed after his 1,000 km free distance flight to write, within 48 hours [ mind you he had to drive with mum in the car back to Belgium, trailer behind!!! after a short but good sleep in a hotel], a prestigious article with pictures and statistics that reads as an adventure book of high quality. Here is the link .ENJOY!!!!! Inspired by the record flight from Lübeck [ N of Hamburg in Germany] to Bayonne/Biarritz [French Spanish border] by Hans Werner Grosse 40 years ago on April 25th and after very good preparations, Tijl started early Monday morning for this not too easy flight. Some time in 1942, a lone Curtiss P-40 Kittyhawk bearing the 260 Squadron “HS” squadron code and the aircraft letter “B” settled down over a wide and remote expanse of North African sand desert called Al Wadi al Jadid. Perhaps low on fuel, perhaps lost, or with mechanical problems, the RAF pilot chose to land in the vast North African Sahara. He extended his landing gear, flared low over the sand and settled onto it. The gear snapped off, the desert camouflaged P-40 collapsed onto its belly and slid for a hundred meters or more shedding its radiators and propeller hub. Aircraft Restoration "The People's Mosquito"
The sky is really the limit. A perfect example of what enthousiasm, creativity and modern technology can do. The People's Mosquito has a simple aim: to see the return to the UK skies of the de Havilland DH.98 Mosquito. During the Second World War many aircraft were funded by the people: companies, towns, villages and organisations. We would like to repeat that model by asking the people of the United Kingdom to help us restore to airworthy condition this magnificent flying memorial that captures the spirit, the pride, the design brilliance and above all the bravery of our country. If you are interested in helping the project or would just like to say hello, you can get in touch with us via Twitter @peoplesmosquito or on Facebook or Google+, or by leaving a comment on our website: www.peoplesmosquito.org.uk. Brussels Airlines will benefit from ongoing European Union legal changes that it argues will level the playing field for nationally based legacy carriers compared to European-wide low-cost carriers which establish outside their home bases. Under previous legislation, airline employees were subject to taxes and social security rules of their company’s home, and not their operating base. That meant, for example, that Ryanair staff in Belgium paid lower taxes and had a competitive advantage against Brussels Airlines staff even though living in the same country. This disadvantage was pushed into the limelight recently by what Brussels Airlines deems was misinterpretation by the foreign press that the airline would move headquarters to a more favourable labour location like Luxembourg. The airline affirms it has no intention to move its staff or headquarters. Brussels Airlines will continue to call its namesake city home. 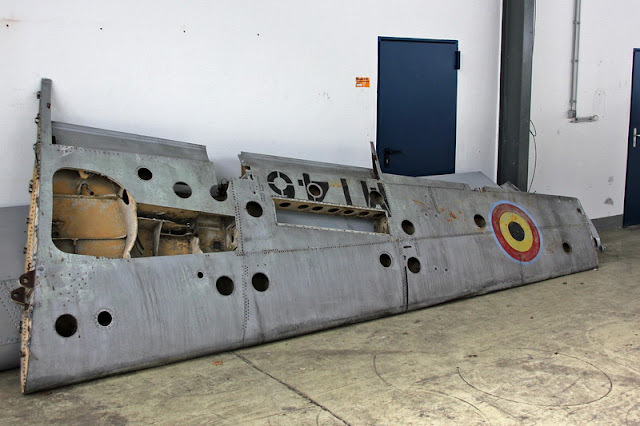 Wings of Belgian Air Force Fouga Magister MT-46 (re) discovered in Mendig (Germany. 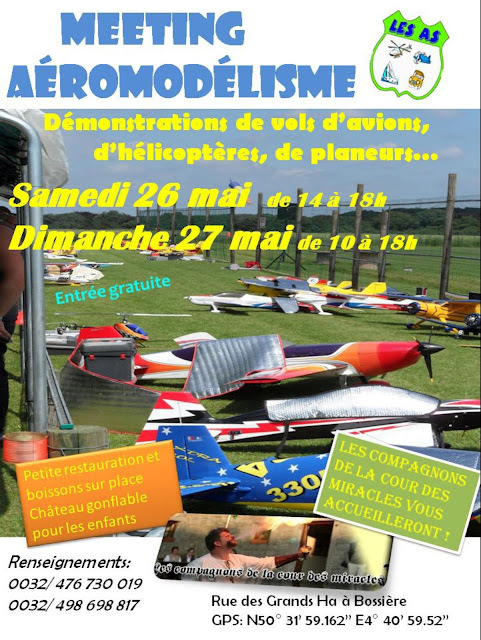 Bob Blog of the Aviation Society of Antwerp (ASA) has (re)discovered the wings of former Belgian Air Forc Fouga Magister MT-46 with an enthusiasti group of aircraft restorers at Mendig (Germany). video: "P-39 AIRACOBRA COMES HOME TO BUFFALO"
video: "Bell P39 Airacobra "Natasha Goes Home""
Bell P39 Airacobra "Natasha Goes Home"
Built in Buffalo, NY, this P39 crashed some 60 years ago in a lake in Russia. This was shot in 2009 as she's being loaded onto a lorry in the UK to be taken to a museum that happens to be in the same building she was original built in. video: "The F-16 Story - AFSC STAFF FILM REPORT 257 (1977) United States Air Force." The F-16 Story - AFSC STAFF FILM REPORT 257 (1977) United States Air Force. BRIGADIER GENERAL JAMES ABRAHAMSON, F-16 PROGRAM DIRECTOR, PRESENTS THE F-16 FIGHTER. HE DESCRIBES THE UNIQUE COMPETITIVE ORIGINS OF THE PROGRAM AND THE MULTI-NATION ASPECTS OF THE CONSORTIUM FORMED TO PRODUCE IT. USING A MODEL AND ENGINEERING FILM, HE DETAILS THE AIR-TO-AIR AND AIR-TO- GROUND ROLES OF THIS LOW-COST, LIGHT WEIGHT ADDITION TO NATO AND THE US AIR FORCE. HE DISCUSSES THE UNUSUAL FEATURES, OUTSTANDING CAPABILITIES, AND ECONOMIC AND MILITARY VALUE OF THIS ADVANCED TECHNLOGY WEAPONS SYSTEM. 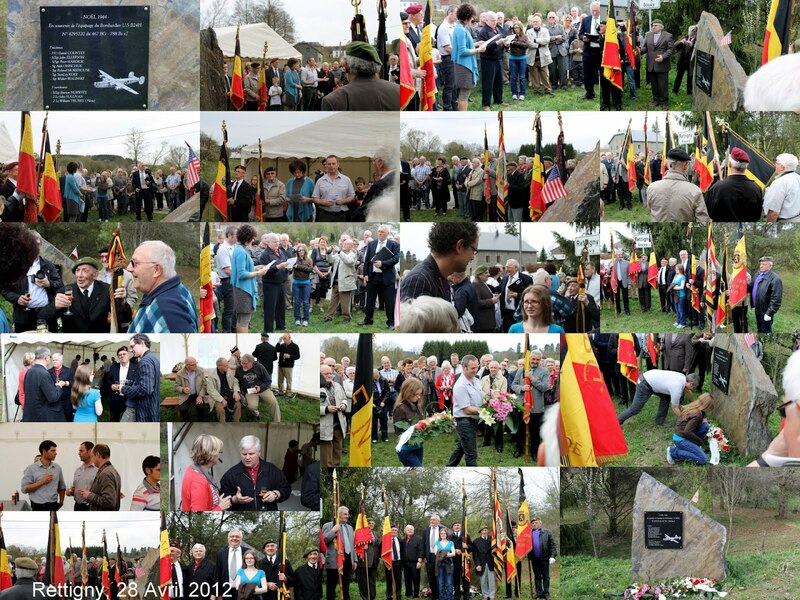 The "Belgian Wings Forum" is back on line.